Increasing standardisation of minimally invasive surgery (MIS) has resulted in increased safety and efficacy for many abdominal procedures. The resultant decreased parietal trauma can reduce wound complications, post-op pain, analgesic requirement and convalescent time. “Scarless” surgery has become increasingly more popular, especially in the young and scar-conscious patients. While natural orifice transluminal endoscopic surgery (NOTES) promises truly scarless surgery, it has remained in the domain of experimental surgery. This is especially true in the field of hernia surgery due to the use of mesh prosthetics where sterility during introduction cannot be assured. Furthermore, operating costs can become exorbitant outside of clinical trials with the need for specialised instruments, most of which are still in their infancy. The need for additional personnel for alternate entry conduits into the peritoneal cavity, such as a gynaecologist, also contributes significantly to this cost. Single-incision laparoscopic surgery (SILS), an offshoot of NOTES, has become much more widely practised owing to the use of conventional instruments with only minor modification in dissection techniques. The decreased number of incisions and the potential for positioning the incision in an inconspicuous position, such as the umbilicus or the suprapubic area, allows for almost invisible scars. 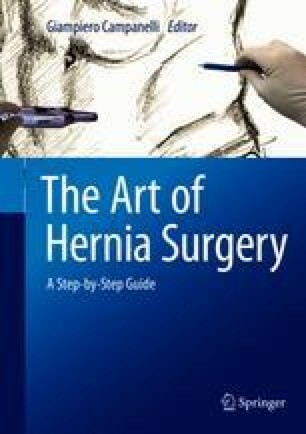 Therefore, SILS represents the first true advancement in minimally invasive hernia surgery in the past 30 years, and, apart from the aforementioned potential benefits of MIS to patients, it adds to the armamentarium of surgical skills of progressive laparoscopists which will further stimulate the quest for improved patient care.